Debido a restricciones por parte del fabricante no podemos enviarle este artículo. Mizuno products to the European Union. "Overall a good top. Slight tight fit but only used the once so far." "Good quality, stylish and great thermal quality." The Mizuno Half-Zip Running Top is made from breath thermo which generates heat for better thermoregulation. 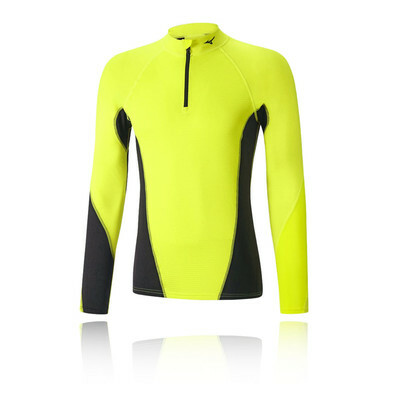 Constecuted using Breath Thermo Technology, the Mizuno Virtual Body G1 Half Zip Running Top ensures comfort and warmth. Having a constant body temperature during cooler months will enable you to tackle the cold and wet weather with confidence whilst maintaining a high-performance level due to the protection and heat retention provided by the running top. It works to capture any escaping body and heat and releases it back into the body. While the primary function of the top is to focus on warmth, the half-zip option does allow you to lower the zip should you require cool air to enter and remain breathable, ventilated and free from distraction caused by sweat and moisture. A soft-touch brushed polyester fabric provides superior comfort. The top also features Mizuno's innovative DynamotionFit technology which is based on anatomical research to create patterns that give improved garment fit and full freedom of movement. Blindstitch technology is added to the garment to prevent chafing and skin irritation while working out, keeping you feeling confident and comfortable at all times. Lastly, Mizuno's nightlite is added which is reflective material that provides superior retroreflection for during low-light conditions, keeping you safe during winter. DynamotionFit Technology - Improve garment fit and full freedom of movement. Breath Thermo Technology - Generates heat for better thermoregulation. Blind Stitch - Provides flat locked seams for chafe free comfort. Nightlite - Reflective material that enhances visibility during low-light conditions. Half Zip - Allows easy layering as well as puts you in control of the ventilation. Material Compostion - 90% Polyester, 10% Polyacrylic.